Mr. Bennet (above) facetiously observes that we are are prone to be too severe on ourselves. Had he been written in the last decade (as opposed to two centuries ago), he might have appended the word, “NOT!” to his statement. One of the reasons I’ve always appreciated Mr. Bennet’s character is just this: he may fail utterly due to a weak will, but he is clear-sighted enough to be aware of his own failings. The reason I have loved his daughter Lizzy more, though, has always been her self-efficacy and willingness to change. As I considered what I intended to write about this week, I heard Mr. Bennet’s voice first. His “mea culpa” in the scene above has stayed with me over the years and comes to me when I am feeling particularly – and rightly – self-critical. This post began when the photo I shared above popped up on my Facebook memories (though its subject has been hovering, unspoken, for a while). The picture is from a particularly memorable weekend in January 2014. The day of the photo, I worked an 8-hour shift on my feet, biked fifteen miles in the snow and cold for fun, attended the mayor’s victory party (another several hours on my feet) listening to speeches by people I admire like Senators Klobuchar and Franken. The next day, my friend Mike and I bundled up for another wintry bike ride, this time to – and on – Lake Calhoun, followed by coffee at Spyhouse. That weekend was indicative of the whole year that followed – jammed full of new experiences, standing in crowds of people listening to folks I admired (mostly musicians, rather than politicians), shift-work on my feet, miles and miles logged by bike and on foot exploring and laughing with friends. By the time the year was over, my average mph by bike had risen from 12 to 16. My feet always hurt but the rest of my body felt amazing – by January 2015, I was in the best shape of my life. Seeing my photo of the Mill City Ruins brought it all back. Looking so closely at my memories from 2014 into 2015, I could hardly avoid the sharp contrast with where I am today – a mere two years later. There has been, in those two years, a spectacular failure of will – mine. I’ve stopped riding or walking, I’ve stopped making time for new people and experiences, I’ve stopped paying attention to my food intake. I am now seventy-five pounds heavier and in horrible shape. My feet hurt, my heels hurt, my knees hate me. Like Mr. Bennet, I need to own it, need to feel it. Though moments of self-recrimination have popped up occasionally, even the worst of these passed by without effecting any real change in my behavioral choices. And now, I’m worried that I’ve left it too late. What if I’ve backslid so far I can’t fix it? I haven’t written much about it here, even though this whole blog began as a record of my weight loss journey – and this certainly qualifies as part of that long travail. I haven’t written about it because I have been too ashamed. Not embarrassed by a number on the scale – I’ve truly learned not to measure myself or anyone else based on that. Rather, ashamed of my self- neglect. Ashamed of my almost willful lack of self-discipline. So, this is probably the moment to call upon my inner Elizabeth Bennet, rather than her father. Lizzy could have allowed her pride to carry her forward, refusing to be seen as fickle in her opinions or wrong in her assessment of character. In doing so, she certainly would have saved herself some moments of extreme embarrassment – imagine having to admit to virtually everyone in your community that you were the complete opposite of right! But there’s a good reason Lizzy is a beloved heroine to generations of women who’ve read Pride and Prejudice: Lizzy chose to grab her chance to be happy even though it meant admitting her mistakes, standing up to those who wished to belittle her (especially that bully, Lady Catherine deBourgh), and working to set right the damage her behaviors had inflicted. This is definitely the moment. But, I can’t help wondering, is there enough of Lizzy’s fortitude in me? Getting healthy and in shape the first time around required all of my attention and energy, plus most of my non-work time. It also sucked up oceans of support from loving friends and family. Now that I’ve pissed all of that away, can I find the strength to do it again? I honestly do not know. But it is about time to find out. In the art of origami, a simple square of paper is folded in such a manner as to be transformed into something else, something other than itself. These days, I feel tightly folded, holding myself erect with the artificial strength of reinforcement from bent and pleated layers. I may appear to have wings, like the crane. But that is an illusion: I am earthbound, folded tightly in upon myself as a protection from all my self-doubt and fear. I want to know my own will, and to move with it. That was, after all, the whole point of the changes which led me here. I felt I had a firm idea of it in April and May, but as the summer passed it slipped more and more from my grasp. August and it seemed to disappear altogether. My days are peaceful on the exterior, but inside they are a turmoil. I have folded my desire for peace, let alone to know my own will, so deep I can’t quite get my fingers on it. I want to unfold. Let no place in me hold itself closed, for where I am closed, I am false. Closed equals hidden, equals secret. Why choose folded, to remain closed? Fear, shame, guilt. Fear of my own inadequacies; shame that after all of the grace and the love I am still much afraid; guilt for the ways (large and small) that I know I am failing the gift of this time. Unfolding. Unfolding equals exposing, unearthing, truth-telling. Exposing my vulnerabilities (the snivelling coward that lurks in my heart); unearthing through careful toil my hopes and dreams; telling the truth about my uncertainties and shortcomings, but also my talents and courage (which share space with that coward). 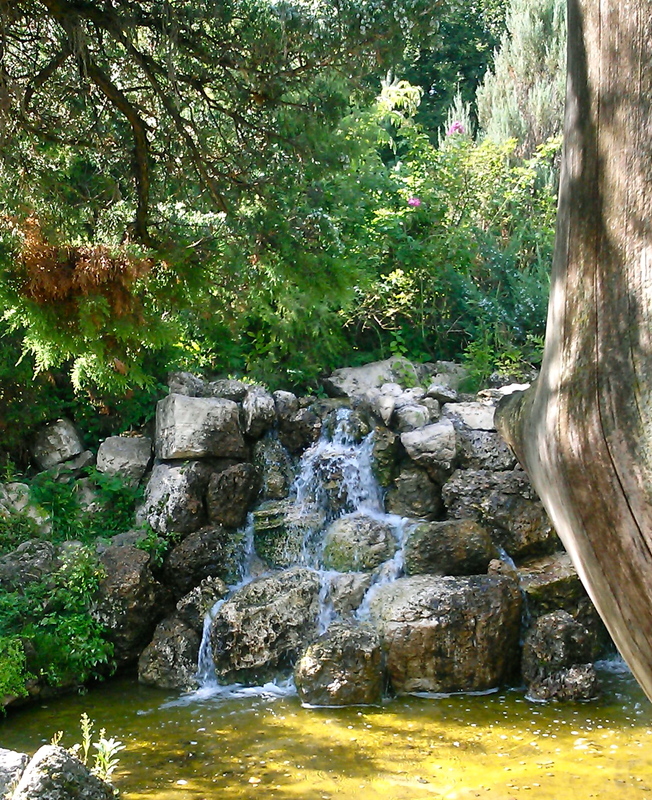 As I sat in the Peace Garden, contemplating the Rilke poem through the oddly curved lens of my current life-in-limbo, I wasn’t thinking about the Divine, or Rilke’s obvious desire for deeper connection and relationship with God. I wan’t thinking of peace. I was thinking about the falseness of being closed – of pretending to be less needy or more sure than I am. Of the artiface, not the art, of origami. 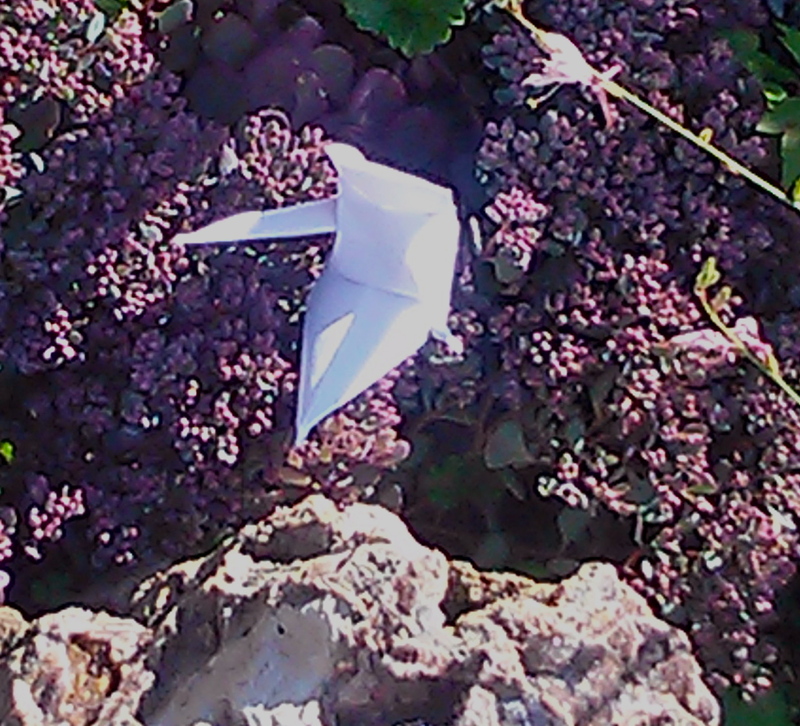 And then I saw it: one tiny white paper crane among the plantings. Fragile and pure, untouched by the dirt it rested upon. 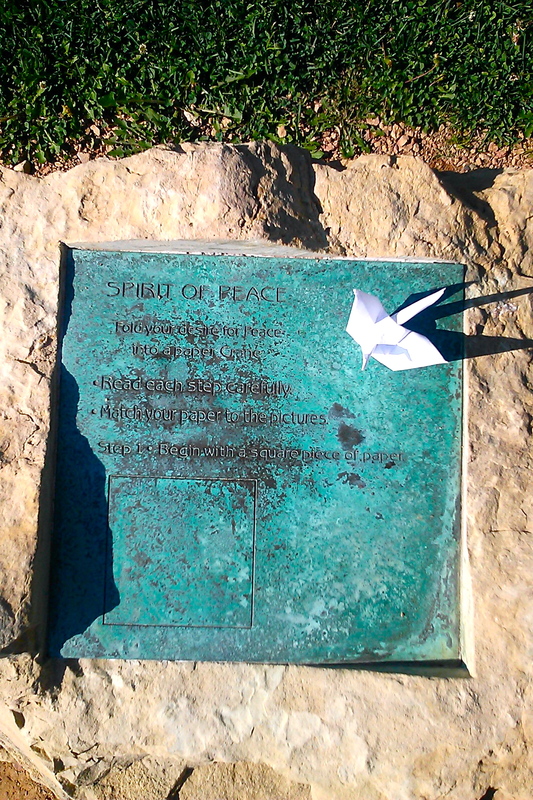 One wish, not the famous one-thousand, for peace. One tiny, fledgeling hope for something better. And I laughed, realizing that while a person should take care to remain unfolded, it is fine for paper. The paper crane was made more by folding, while I was less. Yet both of us yearn for peace – the peace that comes with understanding and compassion. That peace must find a beginning in my own heart.